The lid has been lifted on what’s actually in our bottled water — and it’s probably not what you think. While some brands claim to be full of minerals you wouldn’t find in a tap, turns out filling the glass at home is better for you. And if you’re one of those people avoiding fluoride, well the bad news is it’s in the bottled stuff too. In fact, one company that’s been put to the test — Nature’s Best — was found to be really not that different to tap water at all. In the season two premiere of ABC’s War on Waste popular water brands were put to the test, comparing them to Gold Coast water in one of Griffith University’s testing labs. Australian tap water is subject to stringent testing and regulations to ensure it’s safe to drink but bottled water is classified as a food product and not subject to the same controls which means quality and mineral content can vary depending on the brand. 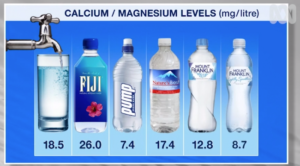 Testing showed tap water has a relatively high concentration of minerals like calcium and magnesium, more than most of the bottled brands, except Fiji water. Water scientist Dr Fred Leusch also looked at the pH levels or acidity, with a seven being neutral and the lower the number the more acidic the water. That’s when it can start to damage tooth enamel. The tests revealed Pump and Mount Franklin were more acidic and wouldn’t pass stringent tap water tests, with Mount Franklin’s sparkling brand the worst in that category. Tuesday night’s program showed how Nature’s Best might confuse people because it is simply branded as “pure, safe, Australian water” on the label. The Sydney-based company does just put treated tap water in a bottle, with its owner previously revealing he just sees the business as “selling plastic bottles” because the “water is basically free”. “I find the name ironic — Nature’s Best, pure, safe Australian — it’s an acknowledgment that tap water’s safe,” he said. “It’s a natural element, it’s found in some of our groundwaters as well,” Dr Leusch said. Dr Leusch said it was easy for people to get confused with all the types on the market and the “gimmicks” being used.